For machine use only. Will not work with hand help dispensers. 3M™ 369 - Economical. Polypropylene backing with a hot melt adhesive. 3M™ 305. Lightweight & cold applications. Acrylic adhesive. 3M™ 371 - Consistent hot melt adhesive. 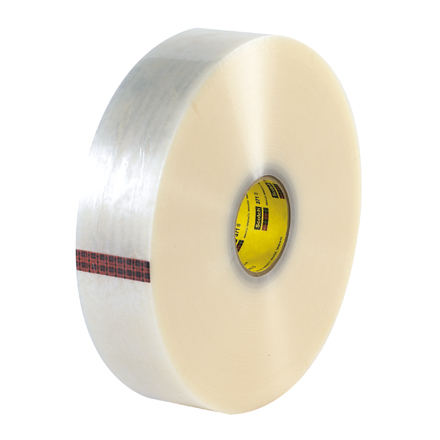 3M™ 311 - Medium weight & cold applications. Acrylic adhesive. 3M™ 372 - Seals cartons over 40 lbs. Synthetic rubber adhesive. 3M™ 373 - Heavy-duty backing with synthetic rubber adhesive. 3M™ 313 - Easy Unwind. Acrylic adhesive. 3M™ 375 - Tough polypropylene backing with synthetic rubber adhesive. 3M™ 355 - For cartons up to 150 lbs. Synthetic rubber adhesive.